Below you find a (non-complete) list of currently open theses and the respective supervisors to contact. Computer-controlled, embodied, intelligent virtual agents are increasingly often embedded in various applications to enliven the virtual sceneries. Thereby, conversational virtual agents are of prime importance. To this end, adequate mimics and lip sync is required to show realistic and plausible talking characters. The goal of this bachelor thesis is to enable an effective however easy-to-integrate lip sync in our Unreal projects for text-to-speech input as well as recorded speech. 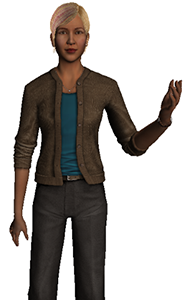 Computer-controlled, embodied, intelligent virtual agents are increasingly common in various applications to enliven scenes turning them into plausible and convincing sceneries. Besides interacting with the human user(s), the intelligent agents are supposed to spend their spare times self-reliant with suitable and application-specific activities. The goal of this master thesis is to design an Unreal Plugin to easily configure these spare time activities for an arbitrary scene and a given number of virtual agents. A social group is defined as a group of virtual agent(s) and human user(s) standing or moving together while plausible and direct interactions between the group members take place. The focus of this bachelor thesis is to design and implement meaningful behaviors of social groups standing in an arbitrary architectural scene, deepened in a conversation. When being approached by one to five human users, the group constellations (including body posture, gazing, etc.) should be updated to include the users into the social group. On a user’s departure, the group constellation should be updated again, to close the freed space. Experiencing a specific virtual world for the very first time requires suitable exploring strategies to quickly visit and remember all locations of interest. One option is to embed a computer-controlled, embodied, intelligent, and conversational virtual agent taking over the role of a virtual guide. The goal of this bachelor thesis to design the behavior such a virtual guide. Thereby, aspects, i.e., maintaining personal space, establishing eye contact, leading versus walking side-by-side, and more have to be adequately considered. In addition, strategies avoiding losing contact with the human user should be integrated. Virtual Humans can be embedded into virtual environments to guide the user through scenes and teach or point out interesting areas. Thereby their behavior has a large influence on the authenticity of the virtual environment and the immersion of a user. One important aspect to this behavior is their movement during speech: co-verbal gestures. The goal of this thesis is to design, develop and test a system to generate authentic co-verbal gestures using RNNs, e.g., Long-Short-Term-Memory (LSTM) networks. Training data for these networks will be provided. The system should become part of an already existing larger software suite to embed believable Virtual Humans into our framework.